Perry Barrow is a local from Morehead City who grew up roaming the local islands. A surfer, sailor and all around waterman, Captain Barrowcuda has explored our Crystal Coast from the land, sea and air. 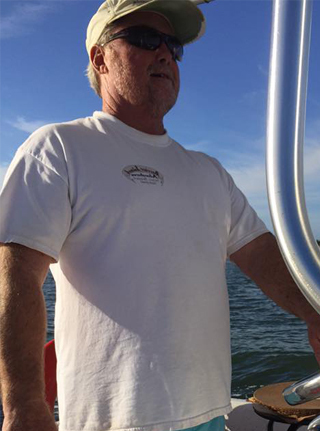 Captain Barrow has been a real estate broker for 30 years, a licensed captain and has had a Master 100 Ton offshore license with a sail endorsement for 25 years and has had his pilot license for 30 years. Captain Barrow managed the Dock House Restaurant after leaving college with a Bachelor of Science degree in Business. He started Outer Banks Ferry Service in 1989 and has been running a fast ferry boat across the Beaufort Inlet to the surrounding islands every day in all weather conditions. No one is more experienced wit the Beaufort Inlet and the surrounding islands than Captain Barrowcuda. His crew is hand-picked to house the same local knowledge and experiences. While in Carteret County, come discover some of the hidden treasures of our Crystal Coast. Relax and enjoy our warm sandy beaches, pristine waters, gentle Atlantic breezes, maritime forests, descendants of shipwrecked horses and unparalleled shelling. Come visit one of the few remaining undeveloped coastal barrier island systems in the world. Observe the natural beauty, wind shaped sands and maritime influences on these uninhabited islands. There are no lines and no traffic jams, so enjoy your ride with us and leave the crowded beaches to others. We begin at 8 a.m., weather permitting, seven days a week, year-round. 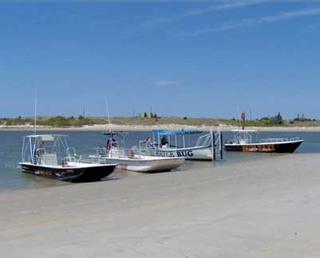 We provide ferry services to the Rachel B. Carson islands, where you can experience the untouched beauty of the Crystal Coast like never before. Finding seashells, and whole sand dollars, watching the wild ponies run and play and relaxing and making memories as a family are just of the few benefits of visiting the Rachel B. Carson Reserve. These islands include Sand Dollar Island, Carrot Island, Bird Shoals and Horse Island. 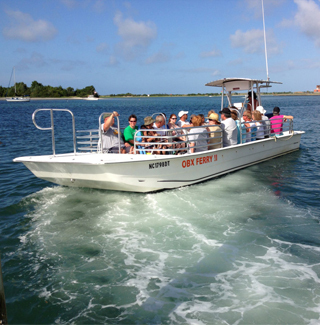 We offer the best rates for tours and ferry rides on the Crystal Coast. Island Ferry Adventures also takes passengers on the original pirate hunt on the secret Treasure Island! Feel free to call or visit us to experience the secrets of the pirates of the Crystal Coast. Tours start with a minimum of 45 minutes up to 3 hour tours depending upon how much fun you want to have and we also provide tours to share the history and untold stories of the Crystal Coast. Take a trip on our Shackelford Banks or Cape Lookout tour to dive into the yesteryear of these waters told by real Carteret County natives themselves. Get an up-close look at the wild ponies and marine wildlife that inhabit Shackelford Banks and the Cape. Private Charters are also available. Please call us for more information on reserving Island Ferry Adventures for a private ferry ride. Children will receive a free sand dollar for every ride on one of our ferries!